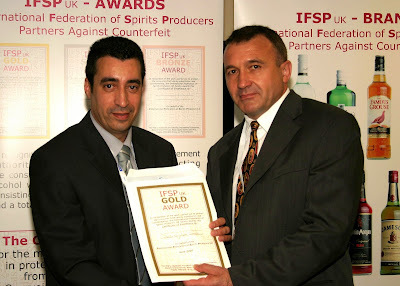 SOUTH AYRSHIRE COUNCIL’S Trading Standards and Environmental Health Services have received a Gold Award from the International Federation of Spirit Producers (IFSP) in recognition of the work carried out to ensure unscrupulous bar staff or owners don’t dupe the public with substituted spirits. Members of the IFSP UK include major producers such as Diageo, Bacardi-Martini, Edrington, Pernod Ricard and Jim Beam Global. The Gold Award was presented to South Ayrshire Trading Standards and Environmental Health Services at the annual Trading Standards Conference in Bournemouth, where 5 Gold certificates, 11 Silver and 10 Bronze were awarded to local authorities throughout the UK along with training vouchers. South Ayrshire Council was the only authority in Scotland to be awarded Gold. The award was in recognition of their efforts in ensuring that spirits on sale are genuine. Spirit substitution is the refilling of premium branded spirit bottles with cheaper alternatives for resale in on-licensed premises, pubs, restaurants, hotels, clubs etc. The alternative spirits used can vary; they can be cheaper own-label spirits purchased from a supermarket or cash and carry, bootlegged brands or illicit spirits. Spirits substitution is not a new phenomenon as the first recorded incidence of substituting spirits dates back to 1872 when 30 pubs in Glasgow were surveyed, it was found that only two of them were serving genuine Scotch whisky! In the last year one complaint dealt with by Trading Standards Officers involved the sale of counterfeit vodka from off-licenses. This led to 3 seizures of fake vodka from separate premises in South Ayrshire. This has resulted in two formal warnings being issued and two reports to the Procurator Fiscal. In addition by circulating these findings further seizures of the offending product were made by Trading Standards Officers in North and East Ayrshire. South Ayrshire has also adopted new methods in detecting substituted sprits. The new method involves the use of the IFSP brand authenticator device, which simplifies the detection of substitution on the premises and reduces the need for submitting samples to the public analyst. If anyone has any suspicions about drinks in this respect they should contact Trading Standards in confidence Monday to Friday on 01292 616403 or by visiting the Trading Standards Advice Centre at 5-7 River Terrace, Ayr or the website at www.south-ayrshire.gov.uk/tradingstandards. There are currently 311 Ayrshire business stories permanently archived on this site. To locate those of most interest to you, please use the site search facility in the top left hand corner of this page. Type your search term in the white box, then click “SEARCH BLOG”.